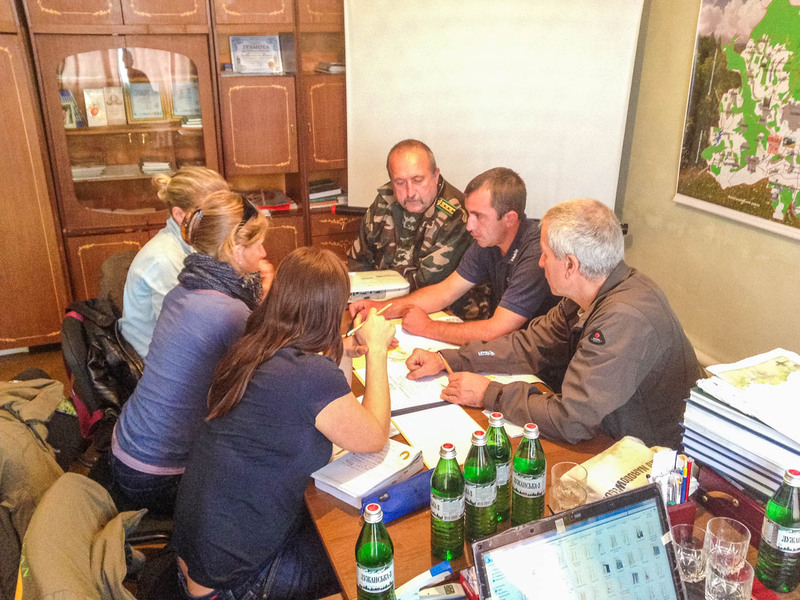 The international team of the European Wilderness Society is currently visiting two Ukrainian protected areas the Zacharovanyy Kray and Vizhnitsky National Parks in order to support the improvement of management effectiveness of the two territories. Latest News: During our preparation, 5 employees of the National Park received the draft notice to join the Army to protect the Ukraine in the Donbass. The dedication to Nature Conservation is regardless of this crisis unfaltered. In the framework of a new project entitled Protecting wilderness for future generations through regional development with the aid of nature conservation, our team carries out the wilderness audit. For several years the Zacharovanyy Kray National Park and the Vizhnitsky National Park have both been committed to protect wilderness and its natural processes. This endeavour was slowed down due to the political turmoil. Nevertheless both National Parks never waivered and continued to lobby for international support to enable an international certification and approached the European Wilderness Society. Zacharovanyy Kray National Parks confirmed its commitment to go through the European Wilderness Quality Standard and Audit System. The purpose to protect these areas is to revive and effectively use typical and unique natural ecosystems of the Eastern Carpathians, which have important nature protection, aesthetic, scientific, educational, recreational and health improving values. The total area of the Zacharovanyy Kray National Park is 6101 hectares. However the 3 protected areas, which will be visited – if connected –form a much larger connected wilderness area. In between all of these a huge long-term potential for sustainable tourism exists. In additional regional development ideas are in need to offset the negative effects of the war in the east of the Ukraine. Both National Parks are interested in improving the effectiveness of their management team of preserving the wilderness attributes of the area. They acknowledge that they need to identify the training needs for the management team. The region has several opportunities for sustainable tourism strategies currently being neglected. The increase pressure on wildlife has been a special focus to reduce the potential of large carnivore and human coexistence problems. Regional development is increasing in importance due to the economic downturn caused by the political uncertainty during the last years. Also the protection of the last virgin forest stands is increasing in importance due to the signing of the Carpathian Convention, which requires their protection. Overall objective of the EWS cooperation with Ukraine is to enhance the management of wilderness areas, enlarge wilderness complexes and ensure that ecosystem services are for the benefit of local people and visitors. Collect data to assist in the development of regional development projects within the framework of the Carpathian Convention to support wilderness protection in the long-term. European Wilderness Network: The wildest places in Europe now online! Why do we need four categories of wilderness areas?